In the apparel industry, professionals always talk about product quality, defects, and quality systems. To the buyer – the end product what they are receiving from the factory, quality should be as per their requirement. No more, no less. Earlier buyers don’t bother how a factory makes quality? How much extra pieces they have processed to achieve all good pieces to handover the buyer? On the other side, factories don’t think how much money they are losing through repair work and garment rejection. It has been assessed unlike last decade now-a-days manufacturer become quality conscious and looking for solutions of quality related problems and many of them demand that they have a good quality system in place and they ship quality garment to the buyer. Even during vendor selection buyers look for factories quality management systems, quality performance history. But the question is do factory measure the quality performance? It not just what you feel about your product quality is, there must be certain performance measuring criteria. We suggest factories track their performance on the following KPIs and on that KPI they improve their quality performance continuous basis. When buyers received something wrong against the contract with suppliers in terms of product quality they claim for the damages. It is huge money to pay back to the buyer. Even factory may lose a business relationship with those buyers due to poor product quality. So customer complaint is considered as most important KPI. It means when garments are inspected what AQL level is being followed as pass or fail criteria. Though it may vary product to product, it gives a clear idea about factory’s quality performance. Lower the AQL you follow better is the quality performance. This term is also known as Defect %. It is a measure of total defective garments founds and total garments inspected in percentage. It can be calculated batch-wise or on the basis of the complete order. Generally factory measure Defect percentage on the daily and hourly basis of the batch. Lesser the defect% better is the quality performance. Factories measure Defect% but don’t track a total number of defects found in inspected pieces. Tracking of DHU is important because of your rework time and workforce required for repairing defect directly linked with DHU number. Lesser the DHU better is the quality performance. Each rework is a cost to the company. The rework costs vary according to the process and types of rework. It consumes extra time and increases factory overhead. Process-wise and product wise rework cost can be tracked to measure it. Lower the Rework cost better is quality performance. For garment manufacturer, RFT quality is an ideal situation. It means whatever activities you do to make the garment, quality of the garment should be correct at the first time. Data can be captured for RFT at each process and it is expressed in percentage. 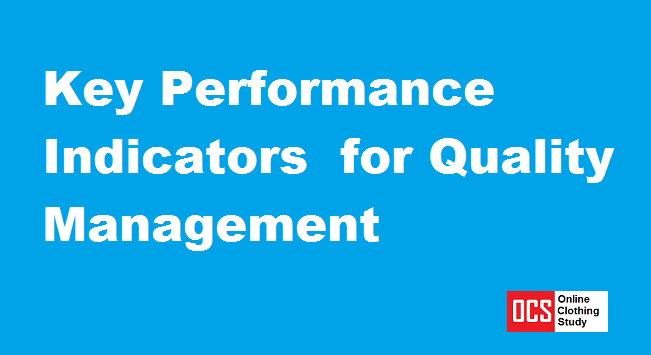 I have written an ebook on Garment Makers KPI that includes all these KPIs with example and detailed calculation method of quality management KPIs. List of quality management KPIs for apparel manufacturing companies.